Earlier this month, I posted Robert Campin’s Virgin and Child Before a Firescreen (where the firescreen acted as a cunning halo). This is the same kind of image, probably by the same painter, or by another painter within his workshop. As painters had only started signing their work in this period, most works went unsigned, and attribution is sometimes difficult. 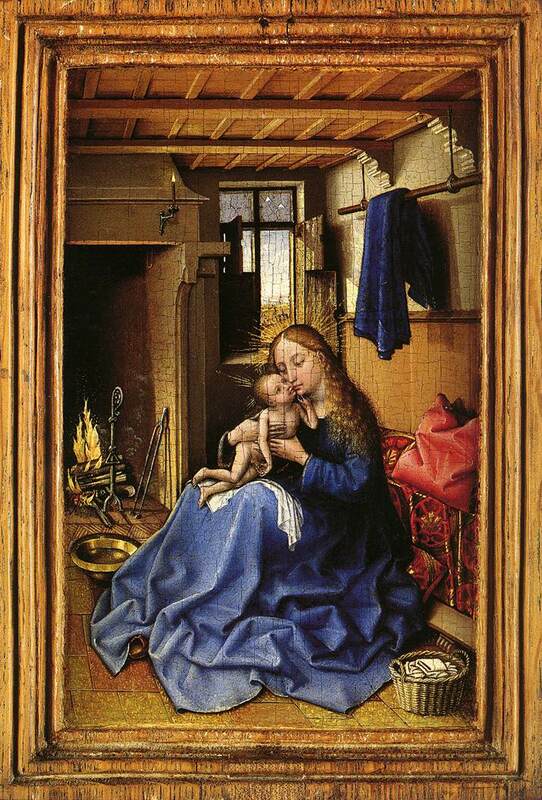 In this cosy domestic scene, it looks like Mary has just given Jesus a bath. There’s a pan to the left of the scene, and a woven basket of clean cloths to the bottom right. She doesn’t have a cloth of honour behind her, but the seat against which she leans serves a similar function. Cloth of gold is unlikely to have actually been used in the furnishings of even a rich merchant’s house (canvass painted to resemble woven cloth was more usual). Unlike in Virgin and Child Before a Firescreen, Mary and Jesus both have haloes. The rays of light are made of gold leaf. Although they’re in a contemporary Flemish domestic interior, there’s still a lot of symbolism. For example, the candle above the fireplace is indicative of the presence of the Holy Spirit, and the water in the pan is a indicative both of baptism and of Christ as the fount of the water of life. This is a very small painting, and would probably have been hung in an interior much like the one it depicts. There’s a nice little article about it here.